A few weeks ago I called upon the sales figures of Batgirl as a rally cry for Gail Simone and her unnecessarily harsh firing from the series. Fortunately, that had a rather quick, abrupt, yet positive end. Now, I wish I could just bury my head in the sand, when it comes to sales. That’s because one of the greatest female books available right now is in danger, due to low sales: Captain Marvel. In December of 2012, Captain Marvel came in at 103, with only 19,970 units. Now, let’s face it, except for the top five books, sales figures weren’t too hot for many high quality books last month. However, right after these figures came out the talk began about Captain Marvel‘s fate. Comic gossip sites have latched onto this news as well. A fan can drone on about how these numbers do not take into account the digital sales figures, friends borrowing copies to read, and illegal downloads (the latter two not making any money for Marvel, therefore not making the property worth it.) Also, keep in mind that Captain Marvel was just named in Marvel’s own list of “Our Favorite Heroes of 2012.” So, perhaps the cancellation rumors are just that, rumors. For the sake of argument, let’s say they’re not and there are bigger issues at play. “Bigger issue, than sales? Jessica, where are you going with this?” Just give me a second. There are two main problems: 1) Inconsistent art teams and 2) Missed Marketing Mayhem. The first problem is an old one in the Marvel camp. Some books are given extremely creative and talented writers who come up with wild and fantastic stories that gain loyal fans. Kelly Sue Deconnick has done this with Captain Marvel, especially with female readers. 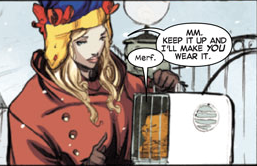 Carol Danvers, as a character, was never just cheesecake. Unfortunately, between the ridiculous costume, and disproportionate body, she was often betrayed that way. In Deconnick’s Danvers you have the strong fighter pilot hero in focus. She’s still beautiful and strong, but reasonably dressed in a stand out uniform (thank you Jamie McKelvie) with mysterious story-lines. You would think this would lead to a great selling book. However, one of the first complaints from issue one was the muddy and dark artwork. I have to admit, I kind of liked it at first. It was different. Then the scenes taking place in the night time hit the page and I was a little turned off too. I persevered and kept on reading, because to me the character was worth more than the art. Unfortunately, many people stopped reading between issues 2-3. The sad part is, art teams have switched in and out since then. 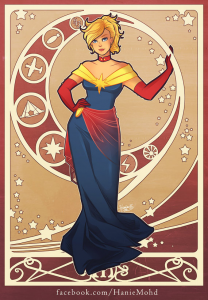 Currently, Captain Marvel‘s style is more modern, artsy with clearer colors, although less defined lines. Here are some unlettered preview pages from Captain Marvel #10, to be released on February 20, 2013. This was also the style for issue #9. This second style I am absolutely in love with. It’s not for everyone. Plus, the original art team is set to cycle back into the series soon. If the art is a major factor of what is turning people away from the book, then they are doing a great disservice to a wonderful character. So a strong female that both female and male readers can relate to: check. Great costume design (hair debatable) creating a prime market for merchandising: check. Artwork that requires a very specific aesthetic and turns many readers off: perhaps this is the biggest hurdle that needs to be crossed. 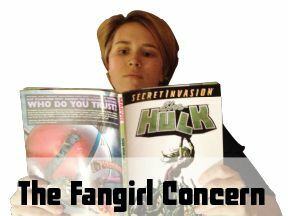 If this is what has been keeping you from reading Captain Marvel, it may be time to give it a second (or in the case of many of you a FIRST) try. Don’t worry about catching up, start with issue #9, and then issue #10. Lately, I’ve been an advocate for not buying a book, just for the sake of supporting it. However, this book has solid story and characters behind it. The main ingredients are there for a wonderful book. It would be a shame to see it end before the publisher gave it the attention it deserves. Thanks for the tip! I’m a fairly new collector because I was intimidated for years with where to start. I finally picked up when The New 52 started with Birds of Prey because I love Batman but wanted to support a female book. I’ve been wanting to branch out too so I think I’ll add Captain Marvel to my pull list. I tried. I really did, but the art is so unpleasant for me. The Picasso eye placement, the fluctuating proportions just didn’t work for me. I did like the layouts of the panels, but pencils just turned me away, which is a shame because I’ve enjoyed previous Ms Marvel titles. I can handle some sketchy art to get to a good story, but for some reason my eye just didn’t like this. I stuck around for the first 6 issues, but you hit the nail on the head, the inconsistent art is why I dropped the book. I didn’t mind Dexter Soy too much, but I still found it too dark for the character. And I really don’t care for the art on issue 10. Maybe, I’ll give it a shot. I love Captain Marvel and would really like this book to stick around; however the way sales are going I don’t think it’s going last much longer sadly. The same can be said for JIM and Red She Hulk it seems that the majority of Marvel fans aren’t interested in reading titles with a female lead for one reason or another.